An aging population that expects to live longer and healthier are among the factors driving innovation in medical manufacturing, such as the miniaturization of medical instruments, according to the Society of Manufacturing Engineers (SME). SME is looking at manufacturing growth sectors in advance of Mfg4 - Manufacturing 4 the Future - May 8-10 in Hartford, Conn.
Medical device manufacturing companies are poised to experience an era of unprecedented growth and opportunity with the aging population living longer, which is accelerating innovation, according to the Society of Manufacturing Engineers (SME). SME is producing Mfg4 – Manufacturing 4 the Future – to break down traditional industry silos and allow medical device manufactures to connect with other growth industries – aerospace, defense and energy – and learn new manufacturing best practices. The exposition and conference, which takes place on May 8-10, 2012, in Hartford, Conn., was developed with an advisory committee of leading OEMs including Medtronic, Remmele Medical, Sikorsky, Raytheon and GE Energy. Most manufacturing conferences focus on a specific industry where attendees can discover the latest in their respective fields. At Mfg4, however, medical device manufacturers will have the opportunity to discover the latest innovations from other fields and learn how to adopt these best practices. Implantable Medical Devices: Demand for implantable medical devices will increase over the next several years, with gains being driven by the development of next-generation devices based on new technologies and improved materials. The fastest growing categories will be spinal implants, cardiac stents and orthobiologics. Additive Manufacturing: Steadily gaining acceptance for production of critical components in the medical device industry, additive manufacturing often revolves around parts with complex geometries and the use of materials that are difficult or expensive to process with conventional methods. Implant manufacturers are embracing this new product method to enhance overall efficiencies. Infection Prevention Product Demand: Our nation’s demand for infection prevention products and services is forecast to increase over the next five years. Safety-enhanced medical devices and medical waste disposal supplies are poised to be the fastest growing products, while protective apparel and textiles will remain the largest segment. Miniaturization of Instruments: Medical equipment manufacturers will continue pushing the envelope of innovation when it comes to the miniaturization of instruments. Newer and smaller implants will help test, diagnose, and even alert doctors to problems with their patients, as well as replace costly routine visits. Industry Resilient to Market Changes: The medical instrument and the supply manufacturing industry will be more resilient to market changes, as they are treated differently by most regulatory agencies and can get to the market quicker than pharmaceutical drugs and biotechnology products. Donna Bibber, president and CEO of Massachusetts-based Micro Engineering Solutions, explains identifying the best material for a medical device, determining the best process to produce the material, and then validating those two factors is critical to micro manufacturing. “Networking at an event like Mfg4, you can partner with other companies that may help solve a piece of that puzzle,” Bibber said. Mfg4 is the first-ever conference and exposition that invites manufacturers and OEMs from four growth industries – aerospace, defense (including arms), medical and energy – to find success and opportunities by connecting, collaborating and sharing common manufacturing supply-chain challenges. For more information about attending, exhibiting, or presenting at Mfg4, visit mfg4event.com or call 800.733.3976. 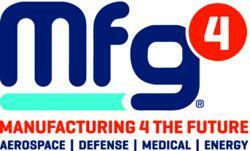 For the most up-to-date details, follow us on Twitter @mfg4event. Mfg4 will alternate years with EASTEC, which has been at the Eastern States Exposition in West Springfield, Mass., since 1988, and returns there May 14-16, 2013. Visit the SME Media Center for the latest Society news, one-stop access to SME Events, Manufacturing Quick links, SME social media sites, SME News Feed and more.